The call came yesterday at 12:14pm. I reached for the phone and noticed it was Mike Tomalaris, thinking he was just back home after yet another epic month in France hosting the Tour de France coverage for SBS TV. I was just about to congratulate Mike on 30 years of service at SBS, which he had delightfully informed us of via social media the day before, but the conversation quickly turned to despair, not celebration. “I’m rushing to the studio to host a tribute to Les for the 6:30pm World News. Would you be available for an interview?” Tomalaris added. The sledgehammer hit me quickly. I knew Les had been ill for a few months but was told he was on the way back. One of his last football engagements was being on a panel to pick the inaugural Marconi Stallions FC Team of the Century. The panel featured four prominent football journalists including Ray Gatt, Mike Cockerill and John Taylor. Les didn’t attend the lavish function on June 24 at Club Marconi but sent me a simple message after viewing a 15-minute video I produced of the night. The message was typical Les. Simple and straight to the point. “Excellent work Andy,” Les said. I responded thanking him and saying that the edit of the video reminded me of the good old days at SBS. And they were golden days. I was an untried, inexperienced commentator when Les made the call in 1984 to test me at a National Soccer League game in Wollongong. I remember it like yesterday. Wollongong Wolves hosted Apia Leichhardt in Round 1 at Towradgi Park on June 30 with the visitors prevailing 3-0. Les selected one of the goals as the best goal of the opening round. At the time I was working full-time as a cadet journalist for Australian Soccer Weekly – a publication which was considered the ‘football bible’. Remember these were the days before the internet, pay television and social media. I first met Johnny Warren in 1983. Les and John, or Mr and Mrs Soccer as they were affectionately known, were inseparable. Even then, I had no idea how far the engagement would take me. In 1985, Les asked me to write a news segment for his weekly Olympic Airways NSL Show every Sunday night. I was like a kid in a lolly store. Award-winning news presenter George Donikian was also part of the football family despite his weeknight commitments hosting the news. George loves the game. I couldn’t believe where I was. Les was the conductor and we all followed his lead. In 1986 there was a new show called Soccerama. It was produced at Harry Michael’s studios, Zero1Zero. Les asked me to actually present that weekly news segment on air with him instead of writing it for him. It was the game changer. We had so many good times on air. The feedback from fans was awesome. 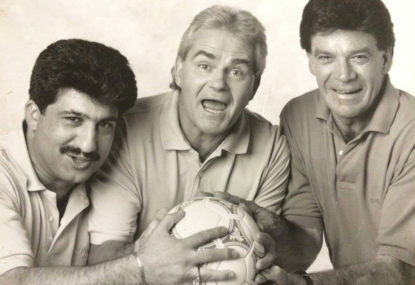 Johnny Warren, Les Murray and Andy Paschalidis. One was an accomplished Socceroos legend. One was a gifted journalist/broadcaster. The other was pretty much allowed to do as he pleased. I was now preaching the World Game to the masses. Les was easy to work with. A mentor to so many. His door was always open. His opinion highly sought. SBS was an institution. We all rushed home from our Saturday matches to watch The World Game at 5.30pm, eager to see all those great highlights from all parts of the world, especially the musical tributes at the end of each show to celebrate the birthday of a gifted player. In late 1986, I was at the SBS studios writing more scripts. At the time I was working for Sydney radio station 2GB. It was the final year of my media cadetship. SBS was starting a new show called Sport Report Australia. Management was looking for a female host. Les jokingly said jump in the chair and do an audition. Guess what happened – I got the job! The game had certainly changed. 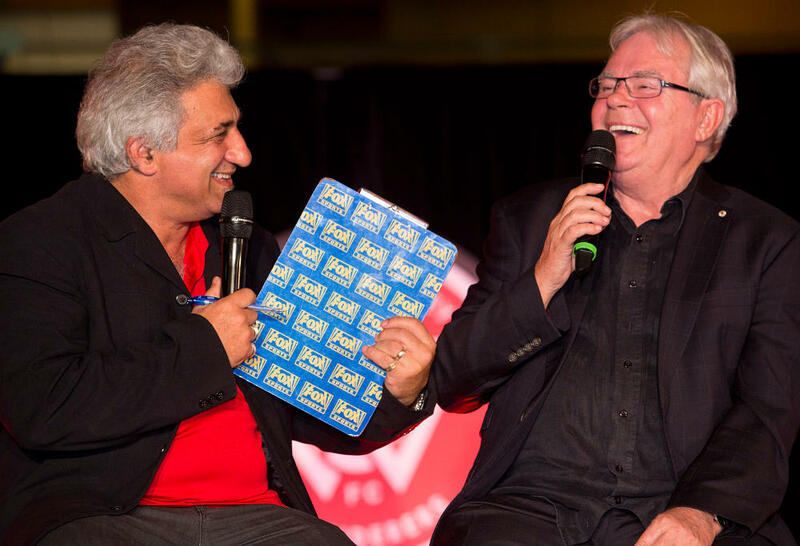 I went full-time at SBS and with Les Murray showing me the way, I would work on some of the iconic SBS football broadcasts. The highlights were many. Commentating. Hosting. Reporting. Producing. It didn’t matter, one just had to adapt. In 1990, SBS broadcast the World Cup for a second time. Les called me into his office and said I would be hosting from the Sydney studios with ex-Socceroos captain Charlie Yankos, while Johnny and Les would be based in Rome. I was just about to turn 28. In a relatively short period of time, I was elevated into one of the most testing jobs at the network. That’s how Les rolled. He didn’t care for age. It was whether you had the passion and could do the job. The only major issue I saw was when anyone called football soccer! Yes, there were many great memories of those ten years at SBS. They were golden years at a time when multicultural Australia and football were entwined. In among that was a Hungarian refugee from the outskirts of Budapest who would make football fashionable with the masses. A refugee who first settled in Wollongong in 1957, like so many immigrants. The fact that my first football commentary was in Wollongong is not lost on me. The fact that I did that SBS interview yesterday next to the statue of Johnny Warren at Allianz Stadium is now starting to hit home. In a sense, I am the last man standing from those golden days of the 1980s and 1990s. The Australian football family, or should that be sports family, is in mourning. Les Murray was a pioneer in so many ways. His legacy will live on. The game will continue to grow. One can only imagine what Mr and Mrs Soccer are up to right now. Having worked in the game since 1983, Andy Paschalidis is a true football tragic. He's covered some of the game's biggest events, including multiple World Cups and European Championships.